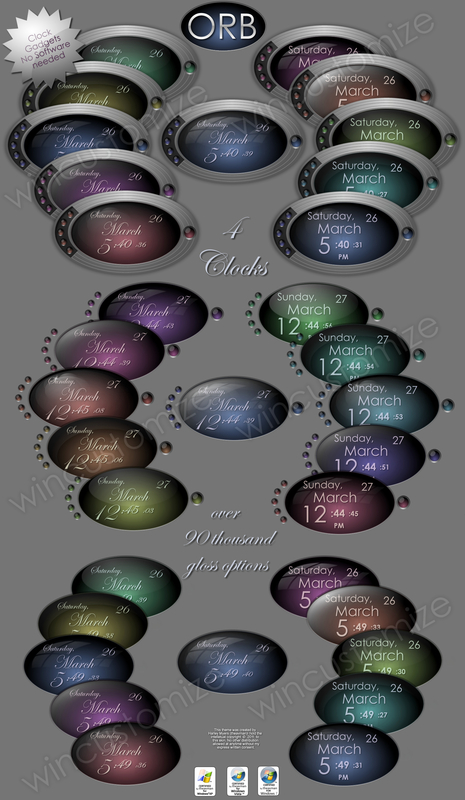 This is really neat little clock!It was designed for my wife !With her guidance and input I think it came out very nice!There 5 different types of gloss types that can be applied and with 10 levels of opacity each that give over 90,000 gloss options then with a doubleclick to the big button on the right you can hide the background and or buttons, a single click in the same spot returns them.that doubles your options plus you have a color slider and opacity slider under right click preferences, and with 4 different style clocks the options are in the millions! Incredible attention to usability.. great work Harley ! You got a ten from me. This is awesome! Uvah thank you as well!! This Desktop Gadget will find its way on to many desktops. Harley, you never fail to amaze me! This is awesome!! John and Jim thank you very much guys!!!! Awesome--it will blend with just about anything. Thanks. Fantastic work on these! Awesome for sure. Thank you all very much !! I am very glad you like it!!! I love how you used a inside bevel to make the clock look recessed into the desktop. Congratulations on the feature theAVMAN. What an awesome clock. The only thing that would be cooler is if it had a Saturation Slider, to adjust the intensity of the color! But I love this. Looks great on my desktop. Thanks! Very nice clock. Tell your wife I said, Thanks! Oh yeah! You too!